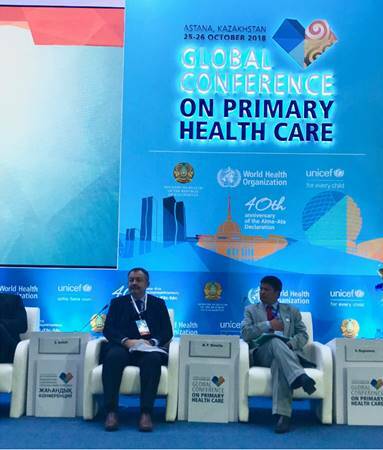 ICOH was invited to contribute to the Parallel Session on “Intersectoral Approach to Primary Health Care and Population Health Management - Policies, Interventions and Services” taking place during the Global Conference on Primary Health Care in Astana, Kazakhstan, on 25-26 October 2018. The aim of the Conference was to celebrate the 40th anniversary of the Alma Ata Declaration on Primary Health Care (1978) and to recommit towards Universal Health Coverage also by releasing a new Declaration (the Astana Declaration) to strengthen Primary Health Care as an approach to modern health and to orient the society and health systems to maximize health and well-being with equity. In collaboration with Dr. Ivan Ivanov (WHO, Department of Public Health, Environmental and Social Determinants of Health, Designated Technical Officer for ICOH/WHO relations), a document was drafted for presentation by the Secretary General in Astana. In line with the spirit of the Alma Ata Declaration, that was “to bring health care where people live and work”, this documents supported the inclusion of occupational health into primary health care settings underlining the importance of ensuring specialist training to the health workforce involved in delivering primary care whenever OH physicians or OH services are not available.